Word Bearers. The fallen Imperial Heralds. The puppet-masters of the Warmaster and Horus Heresy, clash against the Imperial heralds of fate and messengers of death. 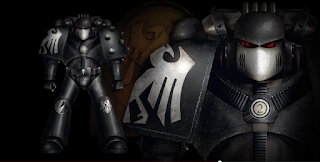 Will the cunning Raven Guard best the traitorous scum or will the Word Bearers overwhelm with fanatical zeal and daemonic brethren. In this game, I battle the Dark Apostle George Tsemberlis. George is a long time NYC Warmonger and 40K player that has recently gotten hooked to 30K. 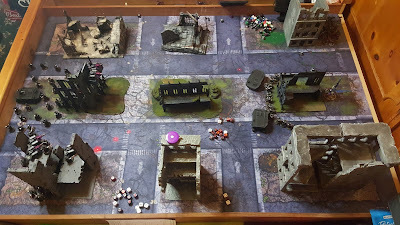 This game was a demo game to encourage more players to join our upcoming NYC 30K Campaign. More importantly, it was our first 30K game against each other!!! 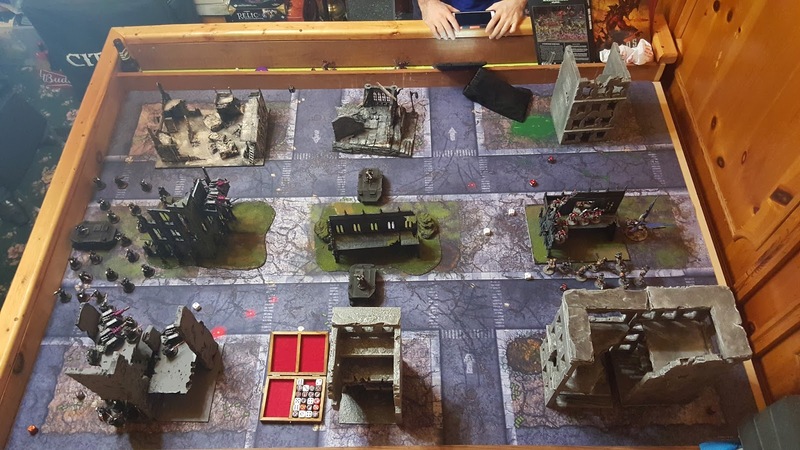 Our armies have battled over the last decade through many editions of 40K and I was sure this game would be epic. We decided to play a random mission out of Horus Heresy V: Tempest. 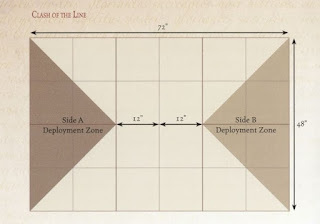 We rolled up the Tide of Carnage mission, which rewards 3 VPs for controlling your own deployment zone, 5VPs for controlling no man's land and 7VPs for controlling your opponents deployment zones. Tanks counted as scoring, Slay the Warlord and Last Man Standing were the secondary objectives. We rolled the Clash of the Line Deployment, which actually ended up being quite interesting from a tactical perspective. The weird wedge deployment meant I'd end up starting a lot closer to the Raven Guard than i would have wanted, especially with infiltrating/scout. 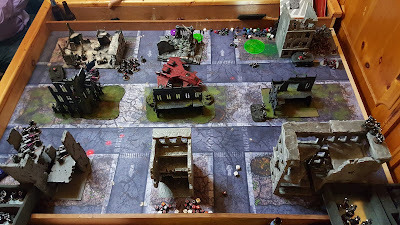 I would've preferred to spread out my army across a long edge but that couldn't really happen, especially when you have effectively 36" of threat. I knew I had to start with SOMETHING on the board, so i did my best to block with the nurglings and put the ashen circle along the edge. I would've preferred to have deep struck them but the hardened armor was probably my best chance at surviving the flamer templates. The triangle deployment zone allowed me to threaten just about anything he deployed and as long as I didn't get seized on, I was in a good position to launch a powerful alpha strike. The long board though, stretched my deployments out though. I considered infiltrating the seekers aggressively and trying to take out Fateweaver early, but I wouldn't have been able to get into 12" rapid fire range. So instead I deployed them defensively and bubble wrapped them with a tac squad to protect the rhino. 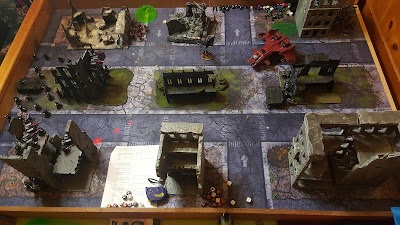 I didn't want the Storm Eagle to deep strike in, kill the rhino and catch some bad luck and lose my counter attack against the Gal Vorbak or termies. The Word Bearers win the roll off and decide to go second. The deploy in the triangle deployment zone with both the Ashen Circle just south of the central, right ruins and a tac squad with Zardu on top of the central right ruins. Fateweaver deploys behind these ruins and a nurgling base deploys on the third floor of the top, right ruins. 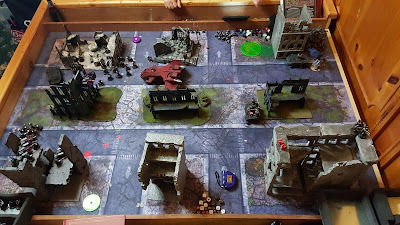 The Raven Guard deploy with 2 rhinos rull of mor deythan infiltrated forward in the center of the board, a large tac squad with Maun and Chaplain, bubble wrapping the plasma seekers in a rhino, behind the central left ruin. One Grav Rapier unit is deployed in the central left ruin and the other grav rapier unit is deployed in the bottom left ruin. 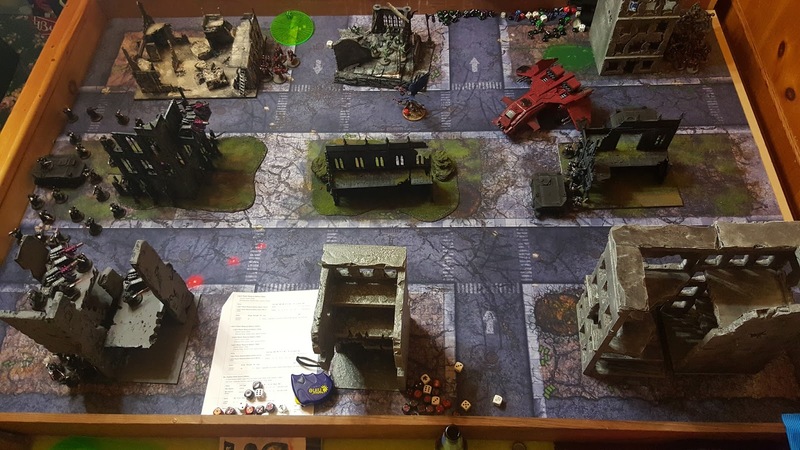 After the Mor Deythan's scout move, the Word Bearers fail their Seize the Initiative roll. The Mor Deythan start the battel off by driving forward, jumping out of the rhinos and using Fatal Strike to make their combi-flamers twin-linked and rending. When the smoke clears, Zardu, the tac squad and the Ashen Circle are killed the man. Fateweaver takes to the skies and summons a unit of plague bearers into the top, central ruins. He then uses Prismatic Gaze, a beam weapon, which rips through the 2 units of Mor Deythan killing 7 Raven Guard. Note to self, warp fire can be nasty! The Mor Deythan and Rhinos stay put and dump as much rapid-fire bolter loving as they can into Fateweaver, hoping to do a little bit of damage. They cause a single wound and Fateweaver Crashes to the ground taking a second wound. The Grav Cannons fire into the Plague Bearers, causing minimal casualties. The Storm Eagle comes in and immobilizes a rhino. Fate Weaver takes to the skies again and moves foreward summoning a unit of flamers and zapping some Grav Rapier Crew. The Gal Vorbak teleport in and land behind the top, left ruins. The large Tactical squads, Chaplain and Maun move forward toward the Gal Vorbak to set up a long charge. The Seekers move forward in their rhino and diesmbark into the top, left ruin. Although their marked quary is the termis, they decide to pop their combi-plasmas and carve a large chunk out of the Gal Vorbak. The Grav Cannons kill off the recently summoned flamers. With the help of fleet, the tac squad charges the Gal Vorbak, beating them in combat. The Gal Vorbak FAIL their leadership test on an 11. They use Fateweaver's re roll to re roll the 6 and roll another 6. The unit is run down and destroyed. Reeling from the loss of the Gal Vorbak, the Word Bearers push deep into Raven Guard Territory. Fateweaver flies behind the middle left ruin, casts Tzeentch's Fire Storm, a Nova attack which guts the seekers, and a grav unit and take s chunk out of the tacs. 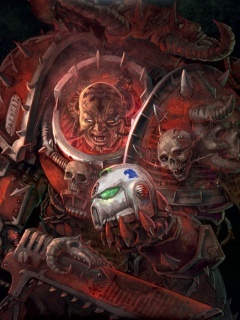 He then summons a blood letter unit. The storm Eagle moves forward and blasts away some Grav Rapier unit, but more importantly is in position to deploy the termies it holds in it's berth. 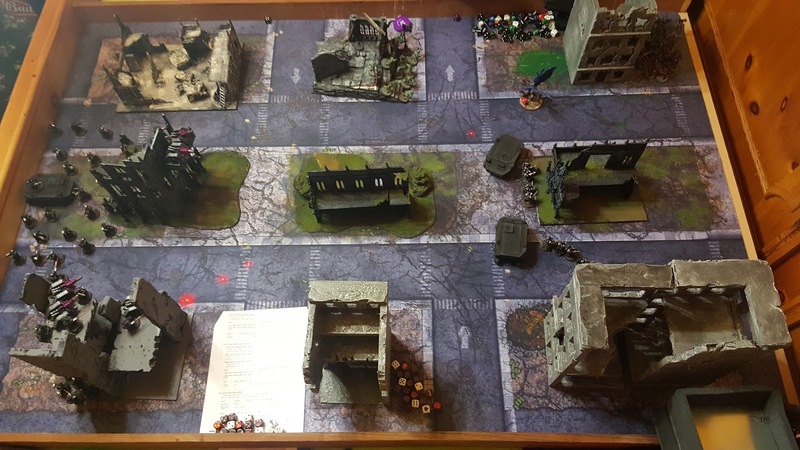 The small tactical squad moves from the bottom left ruins toward the middle left ruins. With coordinated fire power from the grav cannons, they shot the blood letters off the board. The remaining seekers and tactical squad fired at Fateweaver and reduce him down to his final wound. Fateweaver once again uses Tzeentch Firestorm and Novas the surrounding squads, doing solid damage. 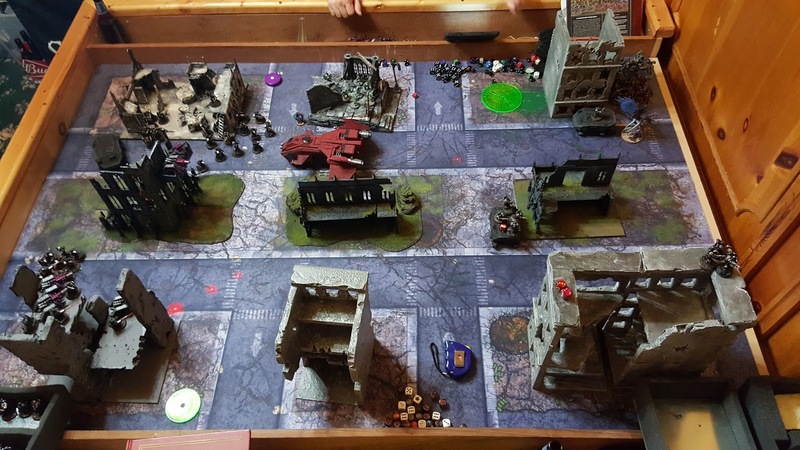 The Storm Eagle lands and termies pile out and charge the Raven Guard Tactical Squad. Both units cause heavy casualties, but are Fearless, so continue to grind. The grav rapiers killed off the landed Storm Eagle and the tactical squad continue to grind away with the termies. The Mor Deythan on the other side of the board, eliminated the nurglings, which locked down control of the Word Bearers deployment zone. The game ends with the tac squad out grinding the termi squad and moving on to engage the plague bearers. Fateweaver, the master of fate, yet again survives the endless onslaught of bolter fire. Note: We chose to count summoned daemons as scoring. Not sure if this correct, but in the end it didn't matter. The game honestly went better than i thought it would after the disastrous start. Fateweaver sucked up a lot of shooting and was able to crap out a good amount of summons to keep it interesting. One thing I would do differently, would be to infiltrate the nurglings to block some deployment spots. I may have taken the first turn as well, even if the odds were good that the Raven Guard would seize. Also made it pretty clear based on this game and my Adepticon tournament experience that it's extremely hard to run termies and Gal Vorbak. I pretty much have to concentrate on one or the other. Finally, I don't feel like I have enough mobile scoring units in my lists, so I'm probably goign to split the veterans out into two tactical squads in rhinos. Getting first turn and not getting seized on, let me set up a pretty vicious alpha strike. I think I took out about 1/3 of his army before he did anything. I also locked down slay the warlord which meant I could basically play for a tie in the standard mission conditions if I wanted to hide Maun. Plus he lost some psychic dice. I was definitely surprised to see Fateweaver and I thought a mini nurgling unit was a clever way to add daemons with a low spend. I didn't think about it until later in the game but the nurglings could have stuffed my infiltrating plans. Daemons are largely thought of as over powerful in 30K, but the ally org chart hugely limits them. I really enjoyed playing against them. In general, my plan went pretty well. I had enough forward fire power to capture his deployment zone and forced him to have to attack my deployment zone aggressively. Holding the seekers back turned out to be the right tactical choice. In the end, every unit in my army performed pretty well. 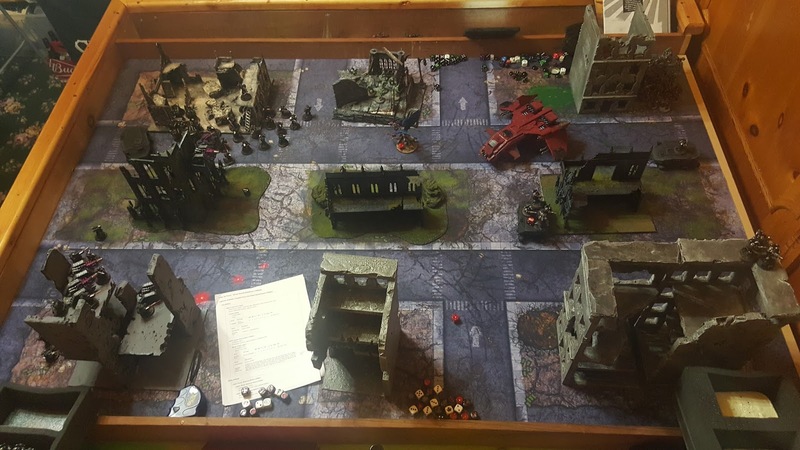 The Mor Deythan were devastating first turn, the seekers really gutted the Gal Vorbak, the grav rapiers popped the storm eagle, and the 20 man tact squad were again the unsung heroes that were anvil of the army grinding their way through the Gal Vorbak and the Termies.